Dear Quote Investigator: There is an anecdote about a fiendishly complex diplomatic agreement. Negotiating, signing, and comprehending the pact had sent one person to the grave, sent a second to a lunatic asylum, and left a third with memory loss. Are you familiar with this tale? 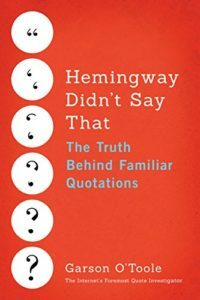 Quote Investigator: This story is based on a remark ascribed to British statesman Lord Palmerston who died in 1865 about the intricate Schleswig-Holstein Question. La questione danese, o per meglio dire dello Schleswig-Holstein era talmente complicata e oscura che Lord Palmerston non essendo riuscito diplomaticamente a impedire quella guerra, soleva spiritosamente raccontare, che tre soli individui conoscevano a fondo quella imbrogliata controversia. Uno era il principe Alberto, che disgraziatamente era morto; il secondo un uomo di Stato danese, che era impazzito; il terzo lui, Lord Palmerston, che l’aveva dimenticata. The Danish question, or better put that of Schleswig-Holstein, was so utterly complicated and obscure that Lord Palmerston, not having been successful in preventing that war through diplomacy, used to quip that only three individuals knew the cause of the tangled dispute. One was Prince Albert, who unfortunately was dead; the second was a Danish official who had gone mad; and the third was he himself, Lord Palmerston, who had forgotten it. The popular theory as regards the Schleswig-Holstein question was that that question had been mastered only by one man, a certain German professor, who went mad in consequence; and the panic appeared to have reached even the Ministerial mind, for when the President of the Board of Trade spoke at Ashton the other day, he frankly told his constituents that he knew nothing about the matter except that we were parties to a treaty. The Schleswig-Holstein question has raised a good many cries against a great variety of people, and one of the cries it has raised has been against Professors. It has been said facetiously that only one person ever got to the bottom of the question, and he was a German Professor, who immediately went mad. In 1873 the Italian book containing a full version of the expression attributed to Palmerston was published as noted previously. Lord Palmerston used to say of the Schleswig-Holstein question, that only three persons knew the truth about this complicated affair. One was Prince Albert, who unfortunately was dead; the second a Danish statesman, who had gone mad; and the third, he himself, who had forgotten all about it. He had, indeed, before declared that the Schleswig-Holstein affair was so complicated that only three men had ever understood it: the first was Prince Albert, who was dead; the second a Danish Statesman, who had gone mad; the third Lord Palmerston himself, and he had forgotten all about it. It was Lord Palmerston, if we remember correctly, who once declared that the Schleswig Holstein question had been mastered by only one person,—an erudite German professor, who died shortly afterward in a lunatic asylum. The Austro-Hungarian question is even worse than this. No one has ever yet been known to master it. Lord Palmerston was wont to say that only three persons ever understood that question: one was dead, another was mad, and the third—Lord Palmerston himself—had forgotten the explanation. The leading interest of the year 1863 was what was known as the Schleswig-Holstein question; of which Lord Palmerston is reported to have said that there were only three men in Europe who had ever understood it, of whom one (the prince consort) was dead, another (a Danish statesman) was mad, and the third (he himself) had forgotten it. The labyrinth of the historical legal, and ethical controversies buried in the slag-heaps of four centuries has resulted in a formidable library on Schleswig Holstein. Palmerston said with more wit than accuracy that only three persons in Europe were completely acquainted with the truth, the Prince Consort who was dead, a German professor who was in a lunatic asylum, and himself–and he had forgotten it. PALMERSTON: The Irish question will always be with us. Only three people have ever really understood it—Castelreagh who is dead, a German professor who has gone mad, and I who have forgotten. In conclusion, Lord Palmerston died in 1865 and the earliest match located by QI appeared in 1873. In addition, the phrasing specified by citations has been highly variable. Thus, the evidence supporting this entertaining quotation is not strong. Nevertheless, the statement has been popular, and future researchers may discover superior citations. Image Notes: Coat of arms for Schleswig Holstein; artist: Jürgen Krause. Map showing Schleswig-Holstein as part of Germany; author: David Liuzzo; licensed under the Creative Commons Attribution-Share Alike 2.0. Portrait of Lord Palmerston circa 1855 by Francis Cruikshank; all three images accessed via Wikimedia Commons. Images have been resized and cropped.